Throughout this lesson, you will learn how to specify a blending mode for a layer in the Layers palette and for a tool in the tool options bar. * For color illustrations of the different layer blending modes available in Photoshop and ImageReady,, see figure 8-1 of the color section. For descriptions of each blending mode, see "Selecting a blending mode" in Photoshop online Help. 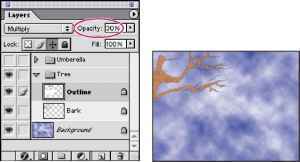 You'll use the Multiply blending mode to blend the white background of a tree outline on one layer with the opaque layer behind it. 1 Choose File > Open, and open the 08Start.psd file in your Lessons/Lesson08 folder. The file opens, showing you one of the layers that has been prepared for you: a mottled blue-and-white texture. This coloration covers the entire image window, simulating a thin layer of wispy clouds against a deep blue sky. 2 In the Layers palette, click the empty box to the left of the Tree layer set to place an eye icon (- ), which reveals that entire layer set in the image window. 3 Again in the Layers palette, click the arrow next to the Tree folder icon to expand the layer set. Two layers are nested in the set: an Outline layer and a Bark layer. An outline drawing of tree branches against a white background now blocks part of the sky. 4 Select the Outline layer in the Tree layer set. Then, at the top of the palette, use the pop-up menu to change the blending mode from Normal to Multiply. The white background disappears, and the brown paint on the Bark layer shows up. 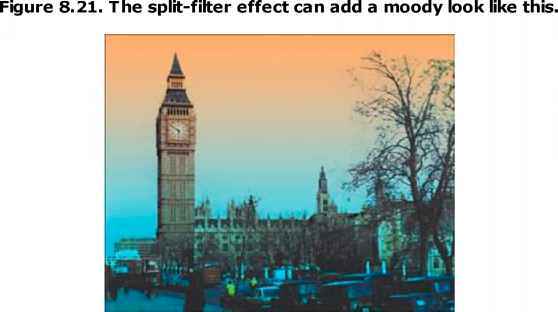 The Multiply blending mode calculates the color for each pixel by multiplying the color information in each channel (such as R, G, and B) by the color channels in the paint pixels. As a result, painting in Multiply blending mode creates colors that are darker than the original colors. 5 With the Outline layer still active, change the Opacity value in the Layers palette to 30%, to soften the outline so that it looks more artistic and less cartoon-like. You'll make more adjustments to the appearance of the tree limb in the next procedures.